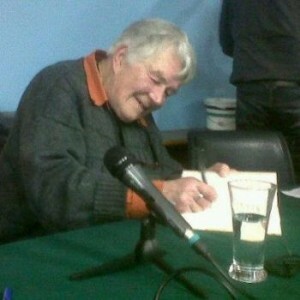 Dervla Murphy is an Irish touring cyclist and author of adventure travel books for over 40 years. She has won worldwide acclaim for her writing which includes twenty six books. Murphy is best known for her 1965 book Full Tilt: Ireland to India With a Bicycle, about an overland cycling trip through Europe, Iran, Afghanistan, Pakistan and India. She followed this with volunteer work helping Tibetan refugees in India and Nepal and trekking with a mule through Ethiopia. Murphy took a break from travel writing following the birth of her daughter, and then wrote about her travels with Rachel in India, Pakistan, South America, Madagascar and Cameroon. She later wrote about her solo trips through Romania, Africa, Laos, the states of the former Yugoslavia, and Siberia and the Middle East. In 2005 she visited Cuba with her daughter and three granddaughters. Her latest book published in 2015 is entitled, “Between River and Sea – Encounters in Israel and Palestine”. Dervla has normally travelled alone and unaided and has encountered many dangerous situations. She lives in Lismore, County Waterford. Mohammed Samaana is a freelance writer based in Belfast. His writing has been about the Arab-Israeli conflict and politics in the Arab world in general. He has also written about racism, immigration, Islam, gender equality and social and political issues in Britain and Ireland. His first article was published in Fortnight magazine but his articles are mainly published in Metro Eireann and Belfast Telegraph. He also published a number of articles in Arabic in different media outlets. Mohammed was born in Palestine where he witnessed the first intifada. After a short nursing career in Jerusalem, he had to leave in order to further his education as studying in Palestine was difficult due to the Israeli restrictions on movement. He received City & Guilds diploma in journalism in 2007 and a master degree in nursing from Queen’s University of Belfast in 2011. Yaser Alashqar was born in Gaza and now lives in Dublin. He holds a doctorate from Trinity College Dublin in Civil Society and the Israeli-Palestinian conflict. He also has a Master’s Degree in International Conflict Resolution studies from the University of Coventry. He lectures at Trinity College on comparative peace processes, Gaza and the Israeli-Palestinian conflict and Israel- Palestine in history and international relations. Organised by the Benedict Kiely Weekend – Omagh Literary Festival. Full details about the festival are here.